Mix ancient Roman Tarragona with the cosmopolitan seaside town of Sitges. Travel back in time and retrace the footsteps of Roman gladiators. Stand on the very spot where chariots raced by, walk across the magnificent Roman aqueduct, and stroll around the ‘Old Quarter’ with its stunning cathedral. Then visit Roc de Sant Gaieta, a tiny Mediterranean village with its mix of Ibizan fishermen’s houses, Seville-style patios, and Roman-Greco influence. Finally, you travel to Sitges to discover the Mediterranean atmosphere of this old fisherman’s village with its shady streets, traditional houses, beaches, bars and restaurants. The tour leaves Barcelona from our city centre office opposite the famous Palau de la Musica monument at 8:30am. Leaving Barcelona, we head south past Tarragona to our first stop of the day, the breathtaking 2,000 year old Roman aqueduct, known locally as ‘El Pont del Diable’ (The Devil’s Bridge). This perfectly preserved piece of ancient Roman history is hardly ever visited by tourists, but often leaves more of an impression on our visitors than any of our other tours. Over 200 metres long and nearly 30 metres high, it is one of the hidden jewels of the area. This is a rare chance to get completely off the beaten track and visit one of the most amazing architectural wonders of Catalunya - and one that hardly anybody knows about. 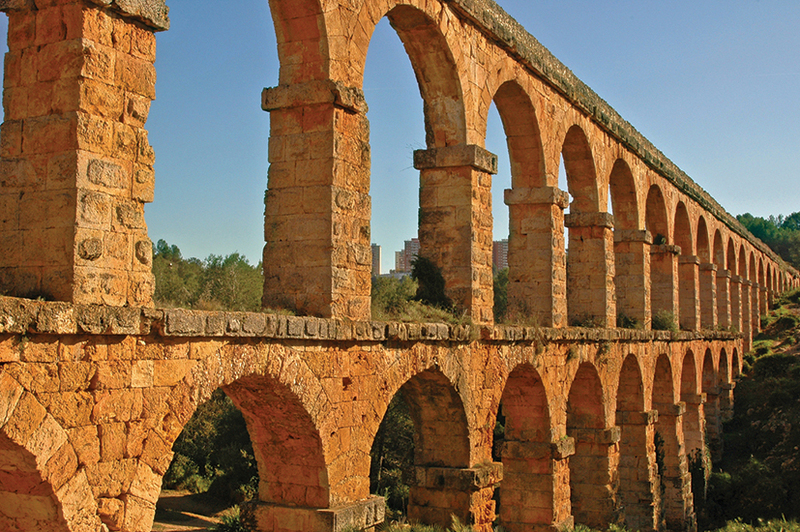 From the aqueduct we travel back to Tarragona, the ancient Roman capital of the Iberian Peninsula, quietly entering the old part of the city through a narrow gateway in the old Roman walls. Starting at the Archaeological Walkway, you will be able to admire the surviving stone walls, wander through the historic old quarter - passing the medieval hospital - before stopping at the cathedral where you can enjoy the Sunday morning antique market. Few tourists ever make it to Tarragona, and fewer still stumble across this traditional market. It’s a great chance to pick up something truly unique from the area. For others, there is ample time to explore the beautiful cathedral that looks down on the antique collectors. From there, you continue down through the old town to discover the Roman Forum and the nearby Roman Circus hidden amidst the urban design. Walk along the underground passageways that held the Circus’ stands and come to one of the most popular squares within the old town: Plaça de la Font, situated inside the Roman Circus. If you stand very still and close your eyes, you can almost hear the chariots racing by. On this very spot, thousands of years ago on, perhaps on the very same day of the week, the Roman capital of the Iberian Peninsula came alive in all of its bloody glory. And last, but certainly not least, enjoy the breathtaking sea-view over the Roman amphitheatre and imagine gladiators battling each other to the death! It’s a poignant moment to stand on the same dusty ground that bore witness to countless scenes of sacrifice and passion. If you enjoy visiting old mediaeval towns, then you might also be interested in our Girona & Costa Brava Day Tour and thePyrenees Mountain Day Tour, both of which visit two of the best 'old' towns in the region. At 12:30pm we leave Tarragona for Sitges. On route, we stop briefly at Roc de Sant Gaieta, an intimate little village built on the rocky shoreline. Stroll between its tiny white houses and let your imagination take you away to Ibiza fishing villages built with a touch of Roman-Greco flair. We arrive in Sitges at 2:00pm, in perfect time for lunch. This once quiet fishing village today boasts a long and sandy beach, groovy boutiques, and a handful of interesting sights. Sitges has been fashionable since the 1890s, when it became an avant-garde art-world hang-out. Get lost in its shady side streets and enjoy the Mediterranean atmosphere with its old whitewashed fisherman’s houses. After a leisurely lunch you might want to head off to one of the seventeen beaches the town has to offer. We meet again at 6pm and return to Barcelona for around 7pm.